KAN – TEN welcomes Steven Berg! Steven Berg is a fiber artisan armed with a wealth of experience, a daring sense of style, and a firm belief in the transformative power of creativity that knitting or crocheting offers to all who are brave enough to push the boundaries. After an eventful career in the fashion industry, his creative work brought him back to his favorite medium, the one that always inspired him the most: the imaginative world of fiber arts. Today you will find Steven in his Minneapolis store, StevenBe: a 6,000-square foot nineteenth-century firehouse adorned with chandeliers, animal prints, and his eclectic collection of objects d’art. 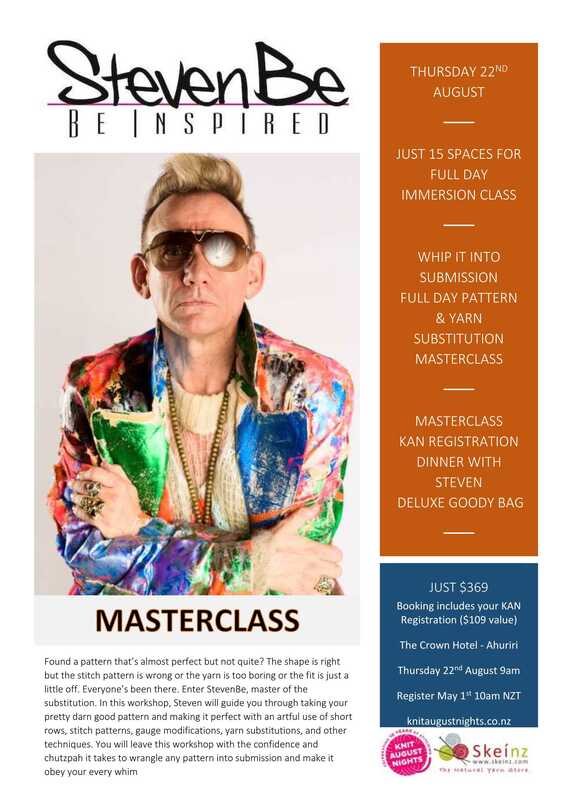 Steven will be teaching a full day masterclass on Thursday 22nd of August followed by a programme of 4 classes across KAN weekend. Steven is perfect for KAN – TEN, his sparkle and exuberant style is fitting for our very special 10 year celebrations & I know you will all make Steven feel incredibly welcome. I know you have all been waiting for this this, because one of the elements that makes KAN so special is the SHOPPING! I will be announcing the traders after registrations in Early May. This is the trading location that we know and love. I have now determined the number of traders that give us a ideal blend of shopping but still allow us enough room to sit, chill, knit and relax. Skeinz will continue to trade off site at our mill store – just a 5 minute drive away. Skeinz is the home of Outlaw yarns and also holds an exclusive sale for KAN every year. The Skeinz Express will run between the venue & Skeinz, with our two regular KAN drivers taking over on Saturday. So fear not – if you don’t have transport – we will be able to ferry you across to Skeinz! I will be running an onsite Eftpos cash out service (debit cards only) at East Pier and there is an ATM just a few minutes away from The Box – so you may wish to start planning your purchases now and what ever budget you had in mind for shopping… double it! I hope you take every opportunity to get out and about to the off site trading locations and explore the Ahuriri Village, which is a wonderful shopping destination in itself & in up coming correspondence I will bring you some of the hidden gems we have in our midst. These will be announced very soon. Visit the Workshop page for full details. Traders will receive invitations to attend KAN from me in April 2019. I will be fixing the weekend trader numbers to 20 only with another 6 Sunday places becoming available. The fewer traders over the weekend meant more social space for participants, less cramped conditions for traders and on overall more relaxed energy. I have had a few inquiries about forward planning for goody bags. These will be aprox 270 for 2019. My team of KAN Angels do the great giant bag stuff the Wednesday prior to KAN, so please have you items to be before that date. I will have the EFTPOS again this year and the venue is providing free open WiFi all weekend to participants. However we did find with so many people online this sometimes went down, so topping up your data plans for the weekend may also be a wise idea. Make sure you bring your smart phone, tablet or laptop because with the WiFi you can download patterns immediately – perfect if you want to purchase from one of our designers trading or see someone sporting a stunning garments & you wish the hunt the pattern out. Wifi will be available in all the classes. PDF’s will be posted on the website www.knitaugustnights.co.nz/news and I do have printed copies of Class requirements, Class location guide, Class lists (in case you forget where you are supposed to be) Pictorial maps to get to your classes, directions to Skeinz if you are getting there under your own steam. ‘Cash is King’ KAN! Many traders will have their online stores and credit card facilities with them, but by no means all of them. There will be an EFTPOS cash out facility on site (whilst my cash reserves last) for a small transaction fee. There is a cash machine on Bridge Street outside Beattie & Forbes Booksellers. As past attendees will tell you, whatever you think will be enough cash for the market…. DOUBLE IT! East Pier is our trading & social hub during KAN. Dave’s team of Vanessa & support staff are really accommodating & will work hard to make sure you are comfortable, fed & watered. Trading will able to take place across the entire event this year in the newly refurbished function room. So there will be plenty of chances to buy or just hang out across the weekend. The special KAN menu will be running again – this was wildly popular last year. This is being moved to Friday night so everyone can enjoy this whilst they are still fresh. This is now INCLUDED in your base registration and is happening at East Pier on Friday evening from 6pm – 7.30pm. Leaving you free to make dinner plans afterwards. The Ahuriri village is not only the KAN venue, but also my home. I live just a few hundred metres away & many of the venues at KAN are friends. They are genuinely very excited to have you in our ‘home’ & hope you have a wonderful time. Please support the local businesses and take every opportunity to get your knitting/crochet out to show the locals how we roll.